Place the stock and apple juice in a small saucepan and bring to a gentle simmer. give them colour. Remove from the heat and transfer into the stock mixture to poach until cooked through (about 10 – 15 minutes). Make the nectarine salad by chopping the fruit into small dice and chopping the basil finely. Combine the two and set aside until ready to serve. 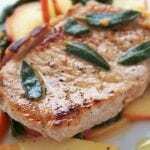 Once the pork steaks are cooked, remove from the liquid. Allow the poaching liquid to reduce by ¼ until you are left with a sticky, syrupy sauce. Pour this over the pork steaks and serve with the nectarine and basil.